Today, September 13, 2017, Emily Leonard, a US Navy veteran and UC San Diego alumna, spoke on behalf of UACT and Universities Allied for Essential Medicines before the University of California Board of Regents. Ms. Leonard delivered a copy of the letter sent to the Regents on May 24, 2017 asking the University of California to drop its pursuit of a patent on the prostate cancer drug enzalutamide (sold by Astellas as Xtandi) in India. The Board of Regents has yet to reply to the May 24, 2017 letter, or a follow-up letter sent on August 9, 2017 to Regents member Sherry Lansing. Good morning Regents. My name is Emily Leonard, I am a US Navy veteran and a 2017 UC San Diego graduate. I am here today on behalf of Universities Allied for Essential Medicines and the Union for Affordable Cancer Treatment to present UC Regents with a copy of a letter previously mailed on May 24th which UC has yet to respond to. 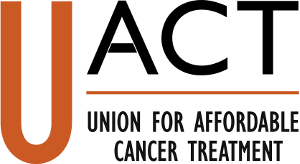 The letter, signed by over 56 medical organizations asks UC to drop patent rights concerning a prostate cancer drug, Xtandi, generically known as enzalutamide. The cost of the drug currently is $49 per pill. Research suggests that if UC drops the patent, that the drug competition will allow this vital, lifesaving drug to be produced for a mere 50 cents per pill. In India, the average annual income is just $1,590. The current average price of the drug for a 28 day supply is over $5,000. Poverty should not be condemning the poor to death by default. I urge the UC Regents to drop their pursuit of a patent. It’s simply the morally right thing to do. Thank you.